"You'll learn to love her. Warts and all." Nanny McPhee is a fantasy children’s film that was released in 2005. The movie takes place in 19th Century England and tells the story of the Brown family. Mr. Brown has seven children who must be raised by nannies because their mother has died. The children hate the nannies that their father hires and they do their best to get rid of them. At the beginning of the film, the children have already gone through seventeen nannies. They also spend a lot of their time bothering the cook that there father has hired. One day, Mr. Brown hears a strange voice in his house which tells him to hire Nanny McPhee. Nanny McPhee arrives at the Brown house and Mr. Brown instantly hires her. She is very hideous to look at it. The children initially do not want to obey her at all but Nanny McPhee is different from the other nannies. She has a lot of magic tricks that she uses to get the children to obey her will. In one scene, she demolishes their entire kitchen. The children are scared and beg her to fix it, which she finally does. They gradually learn to obey her and begin to respect her and ask her for advice. Over time, Nanny McPhee’s appearance becomes less and less hideous and she begins to look more beautiful. An aunt to the children wants to adopt one of them so that she can ensure that he or she receives a proper education. The Brown siblings do not want to be split up. They trick the aunt into adopting Evangeline, who is their scullery maid. Evangeline wants to get a proper education anyway so this is a masterful trick. The aunt also wants Mr. Brown to remarry so he stars to date a woman named Mrs. Quickly. The children quickly realize that Mrs. Quickly is evil and they do their best to disrupt the ceremony. They stage a swarm of bees to attack the priest and the wedding does not go through. After this, Mr. Brown realizes that he loves Evangeline and he wants to marry. Nanny McPhee does a magic trick and the wedding location is covered in snow. This causes all the bees to die. Mr. Brown and Evangeline are then able to marry and the children are happy. They soon live happily ever after. 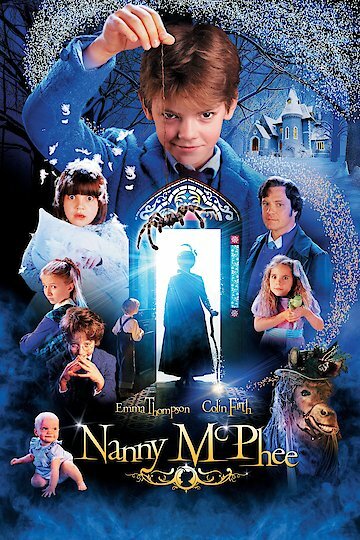 Nanny McPhee is currently available to watch and stream, download, buy on demand at Amazon Prime, Starz, Amazon, Vudu, FandangoNow, iTunes, YouTube VOD online.